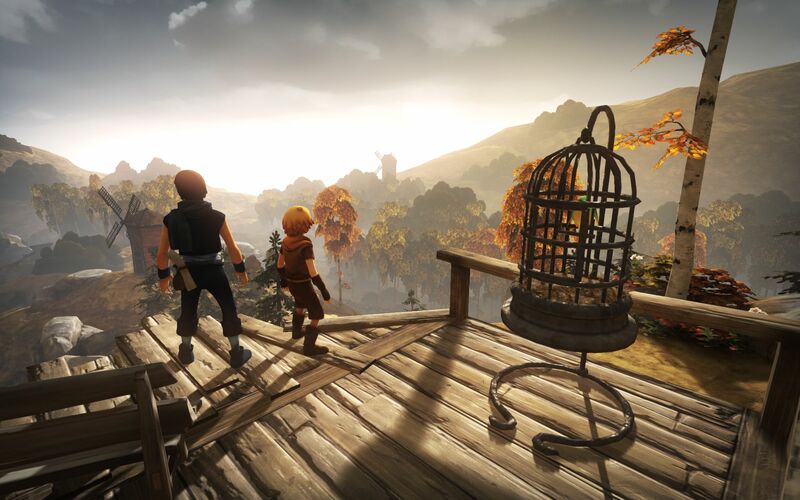 Brothers: A Tale of Two Sons released earlier this year to nearly universal praise from critics and players alike. In my review I described it as “must-play.” I still stand by that sentiment. It’s a special game, and it’s also a very unique one. I asked Josef Fares, the game’s director, a few questions pertaining to the development of Brothers. What was the inspiration for Brothers? Were you guys just playing another game one day and something clicked, or did the idea stem from something more personal? The thing is, my normal profession is as a filmmaker. It’s always been a dream of mine to make a game. It all started with the opportunity to work with a couple of students to make a prototype for the game. I actually came up with the idea for the game four years ago. At that time, I was just happy to put together a demo of it. Then we made multiple prototypes of it. But the inspiration is definitely top-down RPGs, especially ones from the Super Nintendo era like The Legend of Zelda, Chrono Trigger, Soul Blazer, games like that. That’s the main reason it’s a top-down game, but it’s also to introduce something different, to tell a different story. I’m so fascinated by video games and the interactive part of them so it was important to me. What I’m proud of is that, in Brothers, you actually grow as a character, but in an attractive way. Exactly. I felt that there is definitely a need, from a creative perspective, that there are a lot of things you can discover. Especially from independent students, I feel there is much more to come. Brothers is one of my favorite games of the year. Were you guys expecting such a positive response from critics and the community in general towards it? If you’ve read interviews I’ve done before the game was released, I was so sure it would. I remember telling my publishers that if this game doesn’t become a success, you can cut off my hands [laughs]. Whenever people play it and experience it, they understand what’s cool about it. It’s kind of a game that will keep on going for a while. So yeah, I was sure of it. I don’t want to spoil it too much for anyone, but there’s something in the end that’s very important from a creative perspective; a confidence. I just hope people can see that. It’s always a surprise that it’s getting such a huge reception from the community. The idea is that you connect “Left Hand” to “Big Brother” and “Right Hand” to “Little Brother”. You understand why you control these brothers simultaneously when you play through the game. The controls in Brothers are very unorthodox. Was it ever intended to be a two-player game, or was the final control scheme planned from the start? Definitely planned from the start. I can’t even tell you how many arguments I’ve had that it isn’t a co-op game. That would take away the whole foundation of the game. The idea is that you connect “Left Hand” to “Big Brother” and “Right Hand” to “Little Brother”. You understand why you control these brothers simultaneously when you play through the game. Everyone told me ‘Let’s make this a co-op game’ and I can be quite persuasive. That could never happen; it wouldn’t be the same game. So essentially the premise of the game is that you play two separate entities but it’s like one? Right. The idea is that the controls are a part of the story. You physically are Left Hand: Big Brother, Right Hand: Little Brother. And even the brothers are designed from that philosophy. Trying to find a simultaneous gameplay idea that people find fun and interesting. You could say it’s a single-player co-op game. What sort of design or development challenges did you guys face while making Brothers? Firstly, I can say we were something of an uncharted place. There aren’t many games who have tried this control scheme before. Some have tried here and there, but none have taken it as far as this. Another thing is designing puzzles that are fun and challenging for the player. Not challenging in a hard way, but just fun and different. An example I like to use is like tying your shoes; when you do it alone, you feel comfortable. But with two people, it’s going to feel very odd and weird. The hardest thing was actually how to work with the camera. It sounds simple now when you play through the game because the camera is fluid, but that was the most challenging part to me. If you have a regular top-down game with two characters and they separate, you could split the screen but here we couldn’t. We had a code that worked in every gameplay situation to fix the camera. That must’ve been the hardest part. Also, since it was my first game, I was surprised at the amount of work that needed to be done. It was like, insane; I was really surprised. I don’t think it’s depressing. Maybe it’s a little bit sad, but it isn’t depressing. In many ways, I find it encouraging. But that’s life; it’s like ‘You have to go on, you have to go on’ and I think there’s a lot of hope in the game. The Xbox Achievements in Brothers are kind of odd. Players can complete the entire game without getting a single Achievement. Why is that? The idea was actually that I find achievements today quite boring, actually. It’s all about collecting this and doing this and I don’t like those achievements. For Brothers, it’s supposed to be like small stories that you actually achieve something. These stories are part of the theme in the game. Of course it’s a lot of work to get the achievement but I think it’s worth it. And once you get them, you get a deeper understanding. People are really liking these achievements because they are different in many ways. Why did you guys decide to go with a depressing ending forÂ Brothers? I don’t think it’s depressing. Maybe it’s a little bit sad, but it isn’t depressing. In many ways, I find it encouraging. But that’s life; it’s like ‘You have to go on, you have to go on’, and I think there’s a lot of hope in the game. So, for me, it’s not that depressing, actually. Of course, people are feeling sad and I’ve heard some people cried as well. But I’m happy that people are getting a reaction out of it and feeling something, which is great. So the intent was to tug at the heart strings with the ending? Yeah, of course. I wanted to try to tell a story that people felt emotionally connected to. I did feel emotionally connected to Brothers. I connected with it on a level I didn’t know was possible. It’s far from a perfect game, but sometimes imperfection yields great results. Brothers gets so many things right that so many other games get wrong. Pointing out its few flaws feels like nitpicking. It’s one of the best games of 2013. Be sure to play it now if you haven’t tried it out yet. Features Editor Buddy was a journalism major at the University of Alabama. He now spends his days writing novels that will probably never get published and wishing he were an extra in an Anthony Hopkins film. He's been gaming since he can remember and has owned every console from the NES to the TurboGrafx-16 to, yes, even the Phillips CD-i. He loves all games, but his favorite genres are shooters and RPGs. His favorite game is The Legend of Zelda: Ocarina of Time.